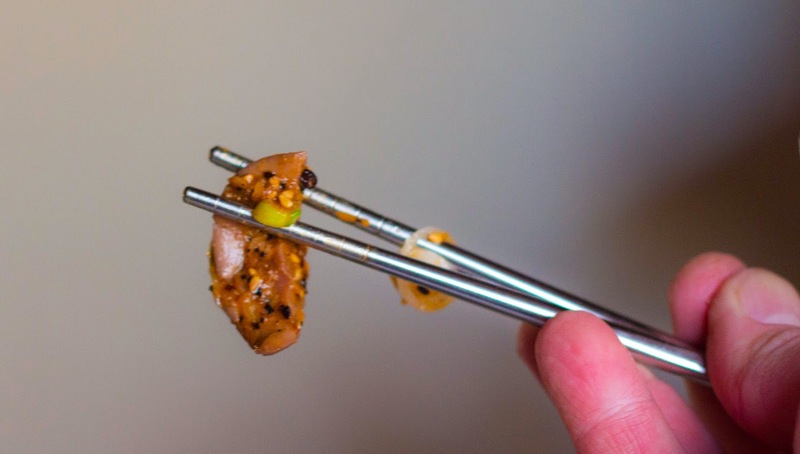 This is a Szechuan dish that caught my attention for how odd and totally unusual it sounded. Cold organ salad, and kidneys of all things? But let's get this clear right away; this is now my favorite way to eat kidneys and one of the most exciting dishes I've had in a while. Even Carla, who will try any organ meat I prepare-although not an enthusiast for offal-loved this dish. She didn't tolerate it, or just put up with it; she loved it. She took leftovers in to work and had them for lunch. I came across this recipe through The Fifth Quarter, which actually pulled the recipe from the 1976 book, Mrs. Chiang's Szechwan Cookbook. I picked up a copy of this book used, as it's sadly out of print. 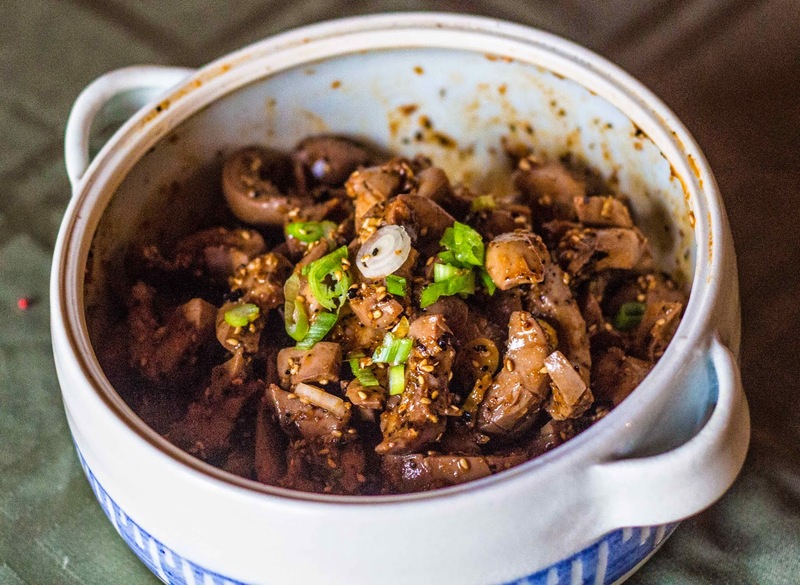 It's a joy to read, but this recipe really has me excited to share it with as many people as possible and ask, "Did you ever think kidneys could be so wonderful?!" Taste-wise, kidneys can be strong. Texture-wise, they can be rubbery. This dish takes both issues into account, and turns them into something sublime. First you half each kidney with a knife, cut out the fatty core, and gently score them in a diamond pattern to increase the surface size. Then slice the kidneys into strips and soak in water. After about 15-20 minutes soaking, let them drain in a colander. 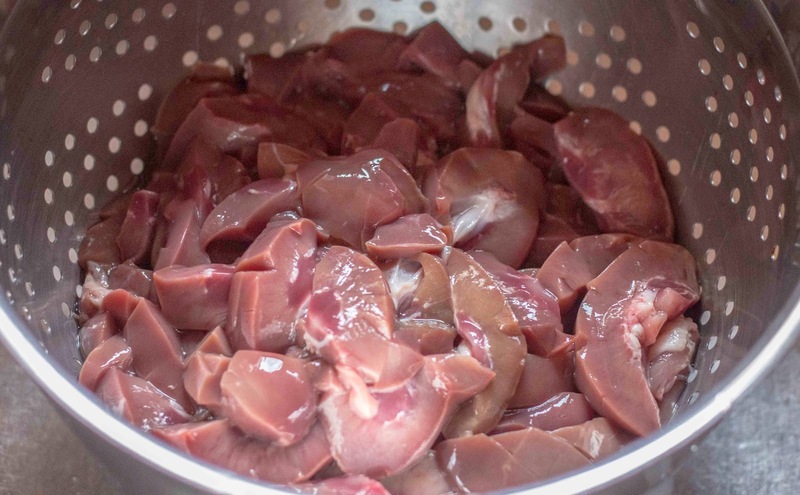 These were the Tamworth hog's kidneys. After the kidneys had drained, blanch them in boiling water for just 3 minutes. This cooks the strips, but keeps them from being over cooked and rubbery. With the scoring, soaking, draining, and blanching, the kidneys are completely flushed of any off-flavors. Interestingly enough, kidneys are high in protein, low in fat, and high in cholesterol. Just like shrimp. Tasting these boiled kidney strips, they really reminded me of the texture of cooked shrimp. As the kidneys cool, a sauce is made of sesame oil, sesame paste, fresh ginger, garlic, scallions, red pepper in oil, rice wine vinegar, soy sauce, and Szechuan peppers. This dressing for the kidneys is actually very light and thin. It's intensely flavored, but doesn't totally overwhelm the meatiness of the kidneys. The dressing is very aromatic, with a good mix of fresh notes from ginger and scallions, offset by the deep flavors of vinegar, soy, dried chiles, and garlic. Served cold, the kidneys were a wonderful blend of flavors, with a nice chewy texture that never ventured into the description of "rubbery." I really loved this this dish and cannot wait to make it again. Carla thinks it would be a great starter rolled up in lettuce wraps.